Beaver Wars Summary and Definition: The Beaver Wars (1640 - 1701), also called the French and Iroquois Wars, were terrifying and brutal wars fought by tribes of the Iroquois Confederacy against the French and the Indian tribes who were their allies, including the Huron, Algonquins and the Mohicans. The Iroquois Confederacy, and in particular the Mohawk tribe, had established trading links with Dutch exchanging beaver pelts for guns. The Iroquois Confederacy wanted to extend their trading activity and gain new territories. A series of bloody battles led to the Iroquois League destroying several large tribes including the Hurons, Eries and Susquehannocks. The Iroquois Confederacy was a powerful confederation of Native American Indians which was originally composed of 5 tribes consisting of the Mohawk, Oneida, Onondaga, Cayuga and Seneca people who inhabited the Great Lakes area, as seen in the above map. The tribes of the Iroquois Confederacy went on to fight in the French and Indian Wars as allies of the British. The fur trade was heavily dependent on beaver pelts. Beavers were nearly extinct in western Europe due to over hunting, and European hat makers had to rely on Russian and Scandinavian beaver fur until North American furs became available. The Iroquois League wanted to extend their territory in all directions and take over the fur trade which operated at trading posts between the other tribes of the region and the European settlers and colonists. Native Indians traded the Beaver pelts for advanced weapons, tools, beads and other European goods, which were highly valued among the Indians and beavers were growing scarce in Iroquois territories. The battles and the wars to gain monopolization of the fur trade became known as the Beaver Wars. This short History Timeline of the Beaver Wars provides fast facts and information about the history, years & dates, key events and famous people who fought in the Beaver Wars. 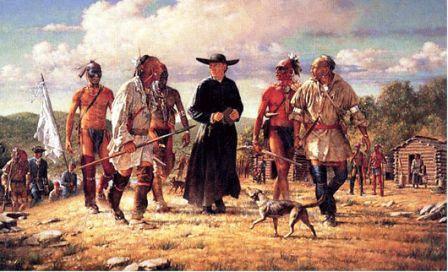 1660: The next attacks made by the Iroquios were on the Susquehannock tribe who are allied to the English in Maryland.